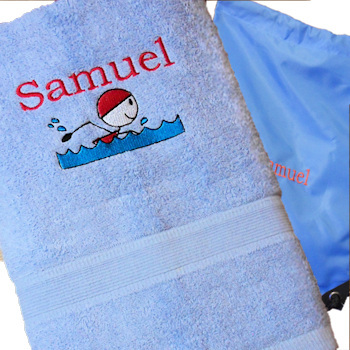 Personalised Swimming Towel and Swim Bag gift set which includes an embroidered Egyptian cotton towel and quick dry drawstring swim bag. Cornflower Blue Egyptian Cotton Swim Towel measuring 125 x 75cm bath size. Embroidered with a cute swimmer motif and a name or initials in your choice of font style and thread colour. Medium Blue Swim Bag made from sturdy nylon with black drawstrings so it can be carried over a shoulder or worn backpack style. Swim bag measures 45 x 34cm ideal for keeping your swim towel and accessories tidy and dry. Embroidered with the same name and colour as on the swim towel.